Choose a native American clan and defend your homeland against invading colonizers! Age of Empires III: The WarChiefs is the first official expansion of Age of Empires III. It is a real-time strategy video game developed by Ensemble Studios, it is published on PC by Microsoft Game Studios on October 17, 2006 in the United States and on October 20, 2006 in Europe. The Warchiefs expansion introduces new maps, a new campaign and three new civilizations – the Iroquois Confederacy, the Aztecs and the Sioux – each that can get different types of bonuses by having their villagers dance around a campfire. It also introduces a new age for European civilizations, the age of the Revolution. In this age the player’s economy is abandoned but it gives the player access to new powerful units. Age of Empires III: The WarChiefs was closely followed by Age of Empires III: The Asian Dynasties. What’s new in Age of Empires III: The WarChiefs? 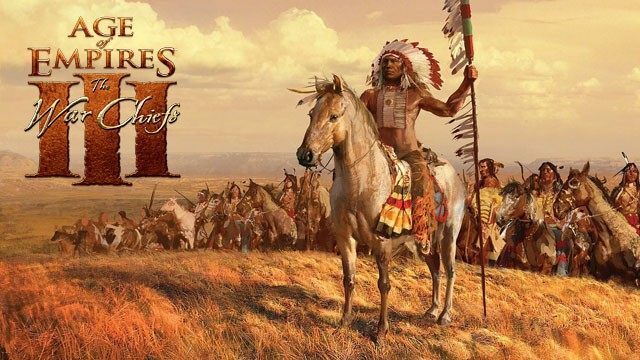 The WarChiefs introduces two new campaigns relating the war of independence and the Indian wars that closely followed the American Civil War. The expansion introduces eight new maps, namely: Araucanía, Andes, California, Orinoco, Painted Desert (Arizona), Northwest Territories (Oregon, Washington, British Columbia), Ozarks and Plymouth. The WarChiefs also introduces three new civilizations – the Iroquois Confederacy, the Aztecs and the Sioux – with their own units and characteristics. The Iroquois civilization is fairly classic and has a good mix of infantry, cavalry and siege machines. On the other hand, the Sioux are particularly different than other civilizations. They do not need to build houses and have efficient cavalry but no siege weapons or defensive walls. The Aztecs, additionally, have no access to cavalry or guns, but instead have particularly powerful mounted units such as the Skull Knights. The three new civilizations also have the potential to obtain different benefits by dancing villagers around a campfire. These dances can only provide one bonus at a time and their effectiveness increases with the number of villagers assigned to them. Their warlords (the equivalent of “explorers”) are also more powerful than those of the other factions thanks to specific powers that allow them among other things to tame the guardians of treasure or to invoke wild animals. Finally, some of their units may also be invisible. What’s new for older civilizations? Factions from the original games have also been upgraded. New units – like ninjas or spies – and new buildings – like the saloon – are introduced. European civilizations are also endowed with a new age – the age of revolution, replacing the imperial age – in which they stop exploiting resources to focus on war. Their villagers then change into armed militia and they get new weapons of war like the Gattling machine gun or battleship.